Who is looking for a new pen? A pen that fits in your hand with ease and comfort? 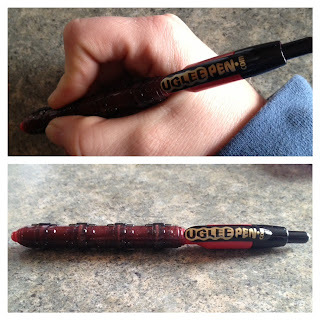 Look no further the UGLee pen is a a great ergonomic pen and comfort pen. Thank-you UGLee for sending me these pens to review and to the giveaway winner. All opinions are 100% mine and I was not paid for this post. If you are a parent and your child struggles with writing then give these pens a try! If you are interested in winning 3 pens from UGLee enter the giveaway using the east rafflecopter form below. I hand write all day long at work! I also handwrite my shopping list. I hand wrote a to do list for this weekend! I write daily in my childrens agenda for school.